Super Dungeon Explore is a game that I have a lot of unpainted miniatures for. The chibi-style figures make a good break from my regular Games Workshop and Privateer Press minis, though. It’s also a game that goes through phases of play in my house: sometimes played a lot: sometimes forgotten in the back of a cupboard. My daughter rediscovered it yesterday, so it’s back on my painting desk again. 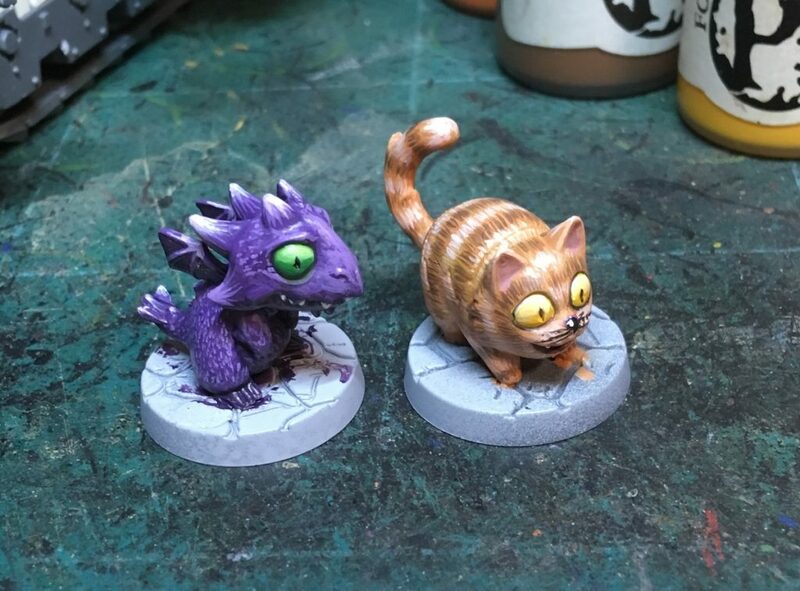 These are two pets from the game. Mr Chompers is a small purple dragon, who spent our last game following the Riftling Rogue around. Admiral Fuzzybottom is a rather large cat, and accompanied the Fae Alchemist. We played with bare plastic figures, then vowed not to do that again. After discussing colour schemes, I painted these two after the kids went to bed. They’re a bit strange to paint, after working on hyper-detailed Games Workshop figures from Shadespire and Warhammer 40,000. I’m still figuring out how to best handle all the large flat surfaces. In this case I opted to paint on some texture – adding fur for the cat, and scales for the dragon.